It is a very simple architecture free from ornaments that was born in the 18th century. The majority of the Colonial monuments in Buenos Aires turn out to be churches. However, we cannot speak of Colonial style with the strictest meaning of the phrase. In fact, its name includes, in a wide sense, the buildings with light, coherent and spontaneous architecture from the Colonization times. 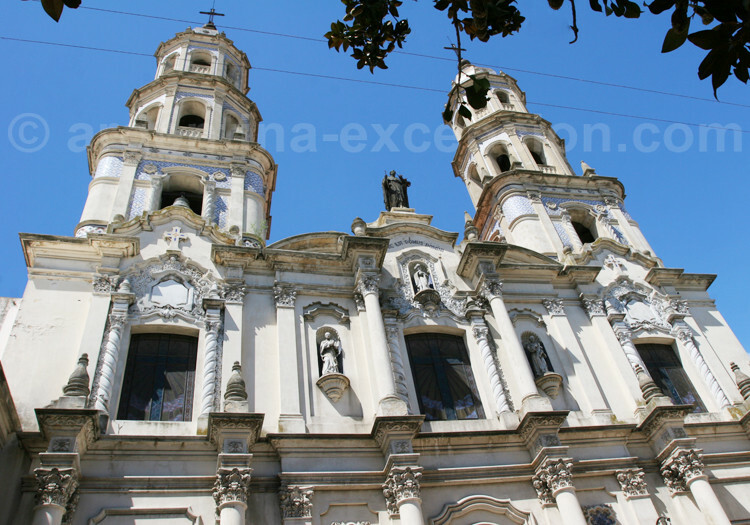 A few Colonial pieces of work have been preserved in Buenos Aires as opposed to the Northwestern region where the Colonial churches flourish in each little village. At the beginning of the Colonial times, the builders were mainly Jesuits that came from Europe to evangelize the South American native population as from 1568. They made constructions more modern by introducing bricks to replace adobe (a mixture of mud and straws) used at the beginning and they used roof tiles instead of straw. The style is characterized specially by the usage of moldings for the doorframes, iron for the window bars and the white walls with deep niches for windows and doors. In these homogenous buildings, only the carpets offer some color as the wall tiles did not exist in Buenos Aires. The ones used came mainly from Pas-de-Calais and Ródano in France. The Cabildo of Buenos Aires is located at Plaza de Mayo and sheltered the offices of the authorities of the Río de la Plata Viceroyalty. It is a Colonial monument where the Spanish political, judicial and economic administration worked up to 1822. 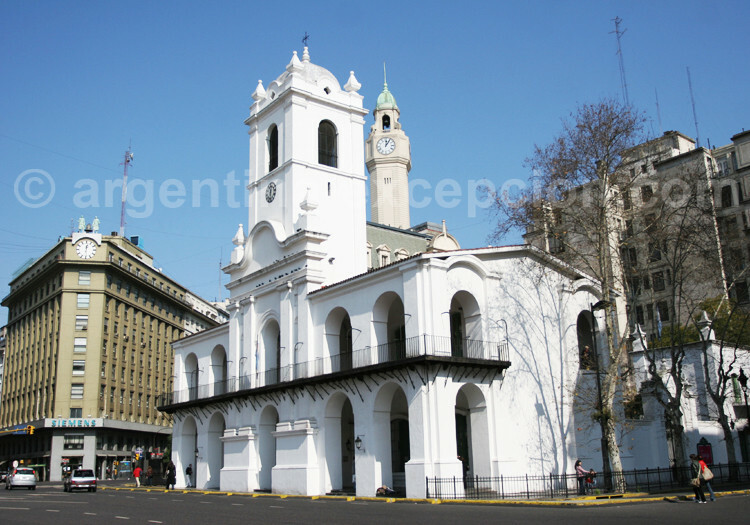 Today it shelters the National Historical Museum of the Buenos Aires Cabildo and of the May Revolution. From 1608 through 1940 it suffered different architectural modifications. The most important one was that of 1894 with the opening of the Mayo Avenue. It had already been deprived of its three arcades from the North side, then they demolished its other three arcades from the South side in 1931, which enabled the Cabildo to have some degree of harmony and it could be open to Julio A. Roca Diagonal Street. Although now it only has five arcades from its original eleven arcades, the Cabildo still preserves its charm in the middle of the many architectural monuments at Plaza de Mayo. 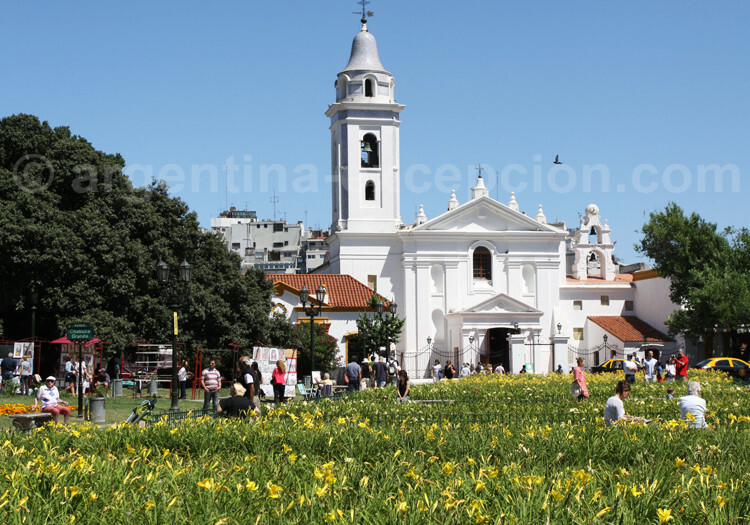 Nuestra Señora del Pilar Basilica located at Plaza Alvear in La Recoleta neighborhood is near the famous cemetery and Cultural Center that have the same name. The construction of the building goes back to the 18th century. In 1866 the current bars were installed and an English clock was put over the bell tower. The main facade, made up of a tower crowned by a needle and a Pas-de-Calais-tiled bell tower, was designed by Architect Andrés Blanqui. The church, restored in the 1930s and 1940s, was painted white again and thus, it looked like its original appearance. 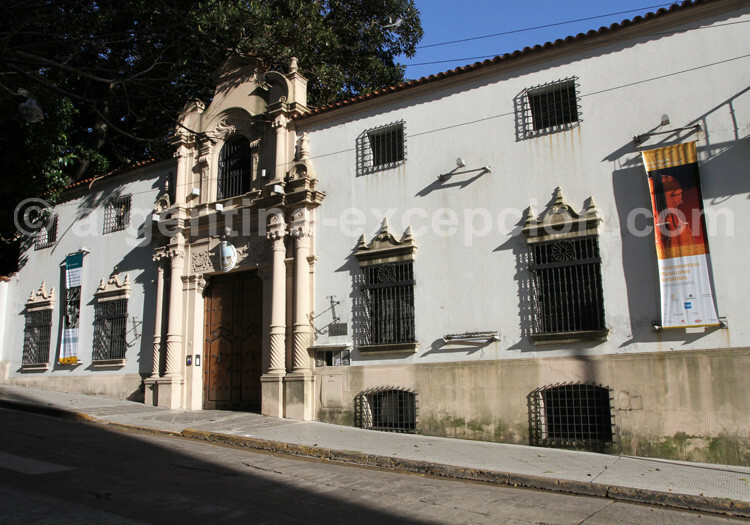 This museum, a typically Colonial building from the 20th century, was named after Isaac Fernández Blanco, descendent of an Argentine wealthy family. He inherited a big fortune which enabled him to have a vast collection of colonial silver work, as well as many enormous ornamental combs from the 1830s. This museum has a library specialized in Spanish American art and a magnificent Spanish garden where there are open air shows in summer time. Museum timetable: from Tuesday to Sundays and Holidays from 2pm to 7pm ARS 3. Library timetable: from Monday to Friday from 11am to 2pm. Manzana de las Luces, built by the Jesuits in Colonial times, is made up of a block located 100 meters Southeast of Plaza de Mayo. It is made up of: Colegio Nacional Buenos Aires, San Ignacio Church, the ancient building of the University of Buenos Aires, the old building of the Argentine National Library, and other historic buildings that received the members of the Jesus Company. 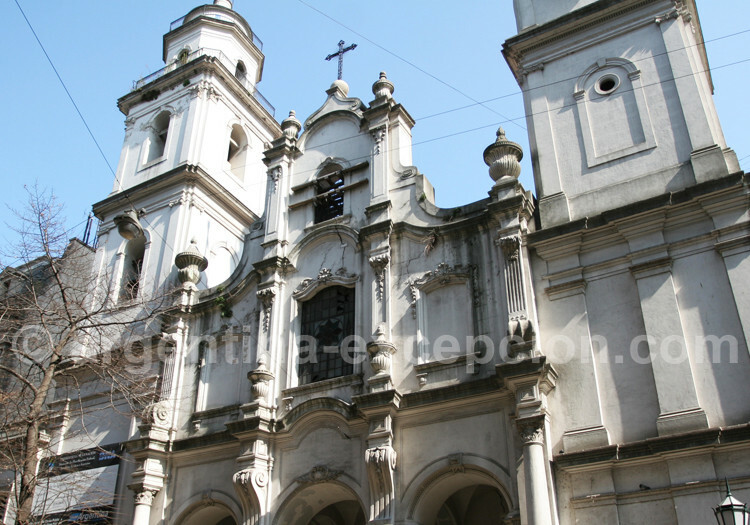 San Ignacio Church is the oldest in Buenos Aires and was built by Jesuits Kraus, Wolf, Bianchi, Pffmoli and Webber. It was opened in 1722 and it had a significant role in the English Invasions. Its facade has a Baroque influence. By mid-19th century, they added the North Tower very similar to the South Tower that already existed, ornamented with small Pas-de-Calais-tiled domes. Guided tours of Manzana: from Monday to Friday at 3pm, Saturday and Sundays at 3pm, 4:30 pm and 6p.m.